David Brower tells us all environmental victories are temporary and all defeats permanent. 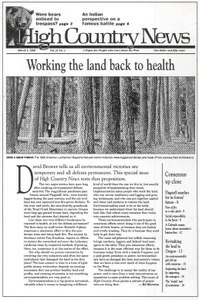 This special issue tests that proposition, with feature articles on environmentalists seeking consensus on how to restore to the Coconino National Forest near Flagstaff, Ariz., to health after a huge forest fire, and an effort in southeastern Oregon to bring together environmentalists, ranchers and BLM staffers to find a way to restore the badly overgrazed landscape. An introduction to two stories in this issue describes how environmentalists are learning to use consensus to heal land thought to be damaged almost beyond healing. In the wake of a huge forest fire, environmentalists seek consensus on how to restore to health the Coconino National Forest near Flagstaff, Arizona. In his own words, Henry Carey of Forest Trust says the forest fire danger is overblown. In his own words, Brett KenCairn of the Grand Canyon Forests Partnership talks about educating the public about its forests. Is there a market for tiny trees? The Ponderosa Pine Forest Partnership in Montezuma County, Colorado, ran into trouble trying to sell the timber it had painstakingly thinned from its forests. Conservative Alaska Rep. Don Young is sponsoring a bill to buy more land for the public domain, but environmentalists are not cheering. Treemusketeers, an environmental group for young people aged 10-14, has started a recycling program in its hometown of El Segundo, Calif.
A group of Wyoming fly fishers is trying to raise money to restore the Platte River in Fremont Canyon. "Lakota Noon: The Indian Narrative of Custer's Defeat" by Gregory F. Michno, allows the winners of the historic battle to tell their story of what happened. "More Dogs on Main Street" by Tom Clyde is a collection of often humorous newspaper columns focused on the transformation of Park City, Utah, from a rough mountain town to a posh ski resort. Sixty environmental groups are petitioning the Interior Department to ban snowmobiles from the 30 national parks where they are presently allowed. A new group called Quiet Use Coalition is trying to restrict motorized access to Colorado's Pike and San Isabel national forests, so other recreationists can enjoy some peace and quiet. Critics say a General Accounting Office report defending recreation fees does not give a full picture of public reaction to user fees. California's Wallace Stegner Lecture Series raises money for the Peninsula Open Space Trust's initiative to protect the San Francisco Bay Peninsula. "Beyond Borders," a gathering for writers, will convene in Flagstaff, Ariz., March 17-21. Teens aged 15-18 can join the Yellowstone Youth Conservation Corps this summer to get paid and learn about the environment. An 80-piece photography exhibit is running until May 31 at the Museum of Northern Arizona in Flagstaff. For the third year, Native Americans and scientists will gather to discuss "Sustaining the Missouri River for Future Generations," March 21-24, in Pierre, S.D. The National Park Service is accepting comments until March 5 on its General Management Plan for the Tallgrass Prairie National Preserve in Flint Hills, Kan.
"Wilderness and Spirit" is a lecture series focusing on human relationships with nature, to be held every week until the end of the April at the University of Montana's School of Forestry in Missoula. Ferry passengers on Puget Sound; Outdoor Writers Assn. and prairie dogs; "Save the rancher" bumper sticker; sewage euphemisms; Paul Bunyan statue at Idaho school; bearded protester at Salt Lake City mall; Utah's roads need repair; ritzy Yellowstone Club. In the Northwest, timber targets fall again as the Forest Service tries to fine-tune the Northwest Forest Plan. Environmentalists and the Forest Service oppose a private company's plan to dam the Dry Fork of the Little Bighorn River in Wyoming. A survey shows that 70 percent of fishers on Idaho's Middle Fork of the Boise were unable to distinguish endangered bull trout from the brook or lake trout they were out to catch. The Bureau of Reclamation plans to send warmer water through Glen Canyon Dam to make the river more tolerable for the endangered humpback chub. Big Sky, Montana's plan to discharge treated sewage into the Gallatin River has environmentalists, locals and even some of the ritzy ski resort's homeowners in an uproar. Who should float the Colorado?